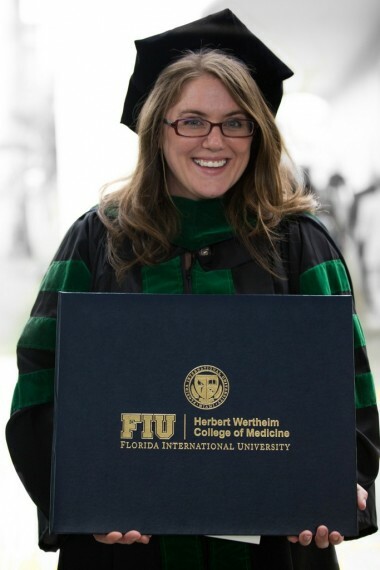 Herbert Wertheim College of Medicine alumna Trine Engebretsen, M.D. has been elected to the board of directors of UNOS, the United Network for Organ Sharing. She will serve as Patient and Donor Affairs and Voluntary Health Organization Representative. Engebretsen graduated in 2013 as part of the Herbert Wertheim College of Medicine’s first class. Engebretsen is a perfect fit for the job. She is an organ transplant recipient training to be a transplant surgeon and has spent her life educating the public about the importance of organ donation. “This will be both an educational and challenging role where I have the responsibility to advocate for those most vulnerable while protecting the integrity of the transplant system,”said Engebretsen, who is an intern at Medical Center of Central Georgia’s Mercer School of Medicine where she is currently doing a general surgery residency. She ultimately wants to specialize in transplantation surgery. UNOS is the private, non-profit organization that manages the nation’s organ transplant system under contract with the federal government. This includes managing the national transplant waiting list, matching donors to recipients 24 hours a day, 365 days a year, and maintaining the database that contains all organ transplant data for every transplant event that occurs in the U.S.
Engebretsen and her family know first hand about the important work performed by UNOS. In 1984, at age two, Engebretsen became Florida’s first liver transplant recipient. Years later she would marry a young man, Ryan Labbe, who had also received a life-saving liver transplant.